Our posters are sure to stand out from the rest. You will find the best price and quality with Printing Xpert. Wwe use the latest equipment for sharpest resolution in black and white or color to create the greatest impact, giving you the greatest return on your investment. When it comes to quality and low cost we offer cheap roll labels stickers printing. The 12x18" paper poster printing for concert will attract your audience and is a great marketing tool for your business promotion. For a bakery shop, you can order our 18x24" paper poster for bakery and let the customers know your deal of the month or new menus. Poster printing is creative and inexpensive. If planning to open a new restaurant, 18x24" poster printing for restaurant will be great to have your customers visit you for the grand opening. 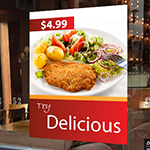 Our static window cling posters are also a great way to display graphics on your windows to promote new products or current sales. 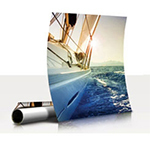 Poster printing offers an affordable marketing venue while adding personal style and creativitity. Ideal for catering service, our 18x24" poster printing for catering service are a self marketing tool. 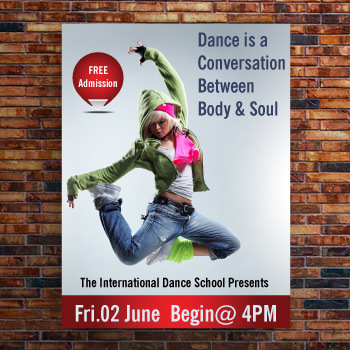 Posters can be unique and detailed with information as to what a business offers, hours, specials, address and more. If you have special offers or running promotions for your beauty salon, go with our 12x18" poster printing for beauty salon. 100lb text are perfect for giveaways, window placements or for posting on construction sites. These can be folded, rolled or shipped flat. 14 pt. cardstock is ideal for heavy duty outdoor use, such as posting on lamp posts or political advertising. 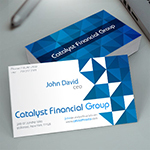 Want to quickly brand your small business in a powerful way? Poster printing is the answer. Poster printing is a fast way to get the word out to the masses no matter what size your business is; and the economical nature of poster printing makes it the perfect method for business and marketing. Retail/Restaurant, Corporations, Community Groups, Educational Institutions, Political Organizations, Lawyers, Dentists, Real Estate Agents, and more! 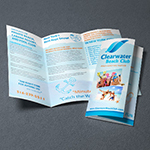 Get potential customers excited about exercising and having fun with high quality paper posters. You'll be able to showcase anything from your upcoming yoga class to tips for weightlifting techniques. More visibility for your fitness company or sports team is only a few posters away! From large colorful posters with photos of make up to attract people on the streets to smaller ones featuring a sale or new spa service, custom posters are perfect for getting people into your store. Customize yours today with personal photos, text and your logo! Custom posters are the best way to get your art or music event noticed to the public. Place posters in the town center to promote your local art exhibit. Place several large posters in the city where your next concert is to get people to rock out with you. A poster having some interesting video game may not strike interest near any daycare center, but certainly a collection of new toys for the kids would definitely have the response. This is an important step of a perfect poster marketing campaign wherein you need to identify the best place to promote your products and services. Always put your posters in a place, which is regarded as high traffic zones where your target audience often dwells. By being in your target audience’s natural environment, you would end up noticing yourself. "My customized posters helped me to get word out on the charity event I was holding in my neighborhood". "Because of the posters, I had a really great turnout." 100lb Glossy Paper This is a high quality, thick paper stock that is excellent for projects. File Status - Upload File Now or Later After the cart and shipping page you can upload file on my account. - Need Custom Design If you require a creative designs service that reveals your company message efficiently while choosing the accurate colors, readable content/text and images in your artwork. Our Custom Design Service will provide you an inspiring designs by our professionals. Product: Poster, 12"x18", 18" X 24", 24" X 36" 4/0 (Full Color one Sided) Consultation Time Included: 15-min Free Design Includes: 3 Revisions Images Included: 2 Images Additional Images: $10 per image Additional Design Time: $39 per hour Base Package Price: $75.00 Prices may vary depending on design complexity or additional requests We also offer LOGO design service starting $75 and up.